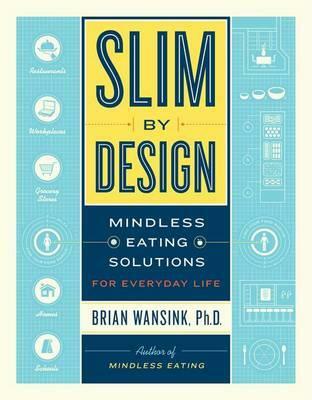 In this paradigm-shattering book, leading behavioural economist and food psychologist Brian Wansink - dubbed the 'Sherlock Holmes of food' and the 'wizard of why' - offers a radical new philosophy for weight loss. The answer isn't to tell people what to do: it's to set up their living environments so that they will naturally lose weight. Using cutting-edge, never-before-seen research from his acclaimed Food and Brand Lab at Cornell University, Wansink reveals how innovative and inexpensive design changes - from home kitchens to restaurants, from grocery stores to schools and workplaces - can make it mindlessly easy for people to eat healthier and make it more profitable for the companies who sell the food. In Slim by Design, Wansink argues that the easiest, quickest and most natural way to reverse weight gain is to work with human nature, not against it. He demonstrates how schools can nudge kids to take an apple instead of a cookie, how restaurants can increase profits by selling half-size portions, how supermarkets can double the amount of fruits and vegetables they sell, and how anyone can cut plate refills at home by more than a third. Interweaving drawings, charts, floor plans and scorecards with new scientific studies and compelling insights that will make you view your surroundings in an entirely fresh way, this entertaining, eye-opening book offers practical solutions for changing your everyday environment to make you, your family and even your community slim by design.